Polar bears use their front feet to propel themselves. Drive yourself to the next level.Polar Bear Stress Ball is made of Squeezable polyurethane foam. These work great as promotional giveaways, keeping your logo right under their finger tips. When things get stressful, nothing is more relaxing than squeezing a custom printed promotional stress reliever, or a logo stress ball. 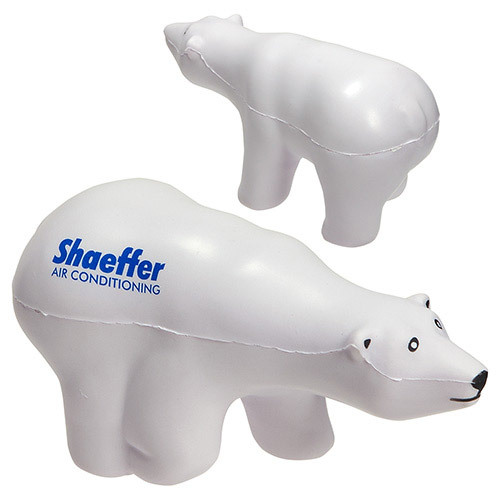 There is nothing cooler than this North American polar bear shaped stress reliever! Measuring 4 7/8" x 2 1/2" x 2", customize this item with your logo or message for brand exposure. Everyone will want one these cute bears at your next trade show or wildlife fundraising event! Safety tested, this item is intended for adults or for general use by consumers of all ages. Our products are not intended for children under three years old or for pets. 4-7/8" x 2" x 2-1/2"
Bulk / 17 lbs / 200 pcs. / 22x15x14 box. Imprint Area: 1.375" x 0.5"